I’ve decided to start up a regular meal planning post on Sunday night. It will usually be a late post, as I don’t normally meal plan until kids are in bed and I’ve done what I need to do for the day. So, you know, probably 11pm 😉 . Thanks to the chilly Melbourne weather, we have been enjoying hot porridge (oatmeal) in the mornings for breakfast. Unfortunately, more often than not, we have leftovers, and until tonight, my chickens have been enjoying eating organic rolled oats, cooked in organic milk. Initially it didn’t bother me too much, but day after day, it felt far too wasteful. 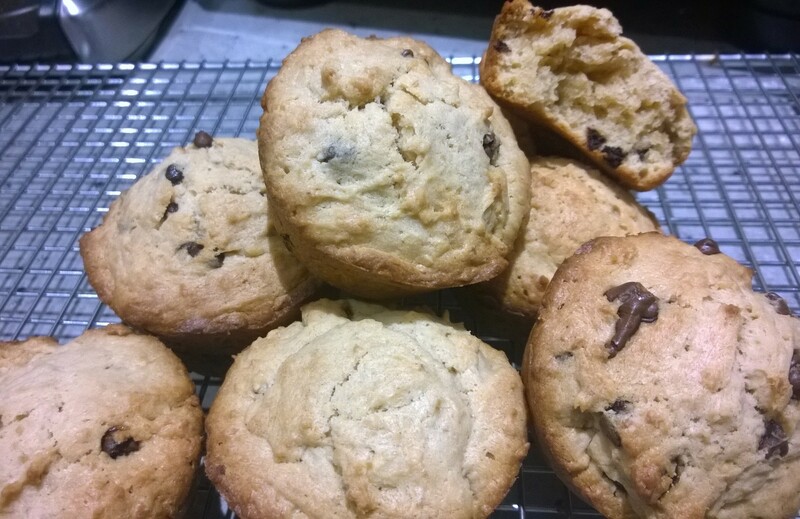 So tonight, I decided to try making muffins using the leftovers, and it worked beautifully! I’ll pop the recipe below. I have been trialling a few different chocolate chip cookie recipes. Some are a more crumbly, some are too sweet, and some are, well, rocks. I have so much easter egg chocolate still in my cupboards, and I have been trying to find chocolate recipes to use it up. I think, finally, I have done it. These are slightly crispy on the outside, slightly chewy inside. Sweet, but not sickly sweet. They aren’t healthy in any way, they have white caster sugar and brown sugar. Don’t replace it with one or the other, as this combination is what gives them their chewiness.